Tirupati Steel Enterprises started trading in structural steel on a small scale in year 1993 and the enterprise has now grown into a leading trader in Chhattisgarh (C.G.) & MP states of India. We have consistently been a leading distributor of steel products. Our aim is to thoroughly fulfill each and every order with the highest level of dedication and attention to details regardless of the order size. We are authorized dealer and M.O.U. 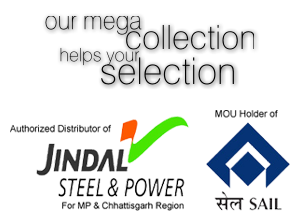 holder of SAIL (Steel Authority of India Limited) and JINDAL STEEL POWER for Angle, Channel, I Beams, Universal Section, Rails, Plates, TmT Bars, Rounds etc. Our clients are our starting point. They drive everything we do. We work in partnership with our client. We have the privilege of working with some of the most well known companies in the country.